There are numerous types of manufactured composting bins to choose from, or you could make your own. 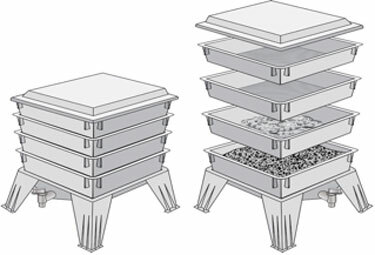 Some bins, such as the “Worm Factory” or “Can-O-Worms”, use stackable tiers for composting. With tiered bins, the oldest, most mature compost is at the lowest level. Advantages to the tiered bins are that the compost is self-harvesting because as the scraps are consumed, the worms tend to migrate up through perforations in the floor of each tier in search of the freshest food source. Tiered bins typically have a drain to draw off excess liquid (leachate). Disadvantages to tiered bins are that the full tiers can be heavy and if you are a person for whom managing heavy things is difficult, maneuvering them can be awkward. It has been my experience with such bins that not all the worms have made it safely through the perforations when you separate them, and are wrenched apart when you lift the tiers, which seems unfair. Converted tote bins are an inexpensive and popular option available in all sizes. There are a number of easily adaptable methods for using totes for Do-It-Yourself worm bins. Tote style bins may also be available through your community recycling program. To be successful with tote bins, you will need to find a way to manage the leachate, which tends to accumulate at the bottom of the bin creating unpleasant conditions for you and the worms. Also, you will need to allow for adequate venting so the worms can breathe, and to assure aerobic conditions. Some things to consider before using tote bins. Worms avoid light, so clear plastic bins are not as effective as opaque bins. Dark colored bins, if left in the sun, will heat up quicker than you think and will roast your worms. There is some controversy about the toxicity of different types of plastics due to their residuals. Polyethylene bins are comparatively benign, but be sure to wash off any dust that may have accumulated on the bin during manufacturing. If possible, select a bin that is certified Food Grade, or has been labeled #2, #4, or #5 plastic. Bins can also be easily assembled from wood or fabric. If you make your own from wood, be sure not to use painted or pressure treated wood. There are many DIY bin making links. I make my bins with a reservoir at the bottom of the bin. Landscape fabric over a perforated false floor separates the composting area from the leachate, which drains through the fabric. Sealing the fabric to the walls of the bin with waterproof tape prevents the worms from getting into the liquid below and drowning. A spigot easily drains the excess liquid, which prevents the bin from getting too soggy, and also allows air to get in to the lower level to help maintain aerobic conditions. Liquid is released into the worm bin as food scraps decompose. Moisture is necessary for the composting process, but too much can became stagnant and smelly if allowed to collect in the bottom of a plastic bin causing your popularity rating with your friends and neighbors, not to mention the worms, to become strained. It is helpful to use a worm bin that helps you manage the liquid. Methods include properly placed holes in the bin, a turkey baster to decant the liquid, selecting a wooden or fabric bin, or through a collection reservoir and spigot. Leachate is not the same as castings tea. It is important to differentiate between the two. While the leachate contains beneficial nutrients and organisms, it also may contain anaerobic bacteria which poses some risk. Castings tea, on the other hand, is brewed from the worm castings using oxygenated water and a food source, generally molasses, to generate a beneficial aerobic micro-organism bloom. The bloom is vital for up to 48 hours in solution so it must be used within that time or it will be of dwindling benefit. Once you have your bin, you will need to introduce the bedding. This is the material the worms crawl around in. The bedding should as much as possible re-semble the worm’s dark and moist natural habitat. It should also be of a texture that allows you to easily bury your food scraps. It’s useful to have a supply of bedding on hand to periodically add to the top of the pile to cover the maturing castings and to provide additional habitat for the worms as they work the top layer of the bin. Adding bedding as the castings mature also acts as a fly barrier and provides fresh material in which to bury your contributions. The most popular and abundantly available material to use for bedding is finely shredded newsprint or cardboard. Other materials to use are coconut fiber (coir), shredded or partially decomposed leaves, aged manures mixed with shredded or composted leaves, hay or old straw. I use a mixture of leaf mulch, aged manure, coffee grounds or coffee chaff (the skin of the bean after roasting). You can purchase coir in bricks from garden or hydroponic supply outlets, or you can recycle it from old unpainted coir flower pots. Not adding sufficient additional bedding material after the worm bin is started is a common oversight for new bin keepers. If after a while you begin to see a buildup of dense muddy looking castings at the bottom of the bin and the pile is not getting taller, you are not adding enough bedding material. While the worms may survive in the densely packed castings, they much prefer the looser oxygen rich bedding to move around in. Feel free to loosen and mix in the older material with the new bedding to introduce the resident organism population to the new material. Note: If you use horse manure in your bedding, be sure it is at least 6 months old in order for any deworming medication residue to expire. To start your bin, you will need five to six inches of moistened bedding material in which to introduce the worms. It’s advisable to have your bin and bedding material in place and ready to go before obtaining the worms. Once you’ve introduced the worms to the bedding you will need to give them some time to move in. Unless you are harvesting your own worms and using familiar bedding, worms will require some time to get used to their new conditions. You may discover that the worms do not want to enter the new bedding at first. If this is so, it is likely that the temperature, pH, or moisture level is dissimilar to the bedding they were used to. If the worms resist burrowing into the bedding, leave a light on over the bin for a day or so to encourage them to burrow. They prefer dark-ness, so will adjust to the new conditions rapidly. I am a purist when it comes to bedding, therefore I have elected not to use newsprint or most other paper products in favor of more natural materials. While newsprint and other paper products have become the popular standard, and are commonly considered safe by many worm composters, I continue to have con-cerns about the toxic compounds that may be present, and that may bioaccumulate in the bin or be transferred to your garden. Many but not all newspapers use soy based inks. Please keep in mind that the term is soy-based. The soy products used in the printing industry are genetically modified. Substances are used to control flow rate and dry time. Soy ink is expensive. Some percentage of less expensive petroleum products may be added to the ink recipe at the printer’s dis-cretion to manage cost. Inks are considered stable, but only when dry. Worm bins are moist. Nowadays, colored inks typically use vegetable-based dyes, but some dyes still contain heavy metals to create vivid colors, especially on glossy paper. Not all paper is the same. Newsprint, which is predominantly recycled fiber, is vastly different than virgin glossy paper. While paper products will arguably work well for bedding material in your bin, I suggest it will serve a higher and better purpose for paper to be recycled on behalf of trees, rather than eaten by protozoa. It is also important to add some fine grit material, especially if you are using newsprint. Worms grind food in their gizzard so require the grit to “chew”. Sprin-kle a cup of very fine and well rinsed sand on the pile. One source of grit that seems to work well for me is dried and finely ground up eggshells. I grind them almost to a powder in the blender. Add more grit after each castings removal. Worms adjust their bin population according to the carrying capacity. If you observe the population dwindling but you know there is plenty of food, one reason could simply be not enough grit to access the food. Once the worms have established their habitat, you may occasionally notice larger than usual numbers of them on the walls of the bin. This is especially so with plastic bins which tend to develop a film of condensation on the walls, and on which the worms can navigate. If this happens and they are trying to leave the bin as well, then it is a sign that the bin is too wet, too hot, too anaerobic, or the pH is not suitable. Please adjust accordingly. If there is too much food that is rotting before it can be consumed causing anaerobic, aka stinky, conditions, discontinue feeding for a week or even longer. Feel free to put on your de-signer rubber gloves and expunge the stinky stuff. All that said, sometimes a few worms just seem to socialize in the corners and crevices of the bin and, um, “go on dates”. If they are not trying to leave the bin, and you would prefer that they please go back to work, then leave the lid off in a well lit room or keep a light on for a day or so and they will go back down. If they are not trying to leave the bin, leaving them alone is the preferred option. As mentioned earlier, worms are sensitive to light and moisture. They are also sensitive to temperature, pH, and salinity. The optimum temperature range for the worms to be the most productive is between 50°F and 80°F. A comfortable pH range is between 6.0 and 7.0. They will also acclimate to higher or lower temperatures and adapt to gradual changes in pH over time. But they will perish if allowed to freeze, and escape or perish if too hot. Worms breathe through the moisture layer on their skin, but can drown if it is too wet. It is important not to let the bin become too dry or too wet. Visualize a well wrung out sponge. If you can squeeze liquid out of your bin material, it is too wet. Worms prefer to be left alone. They do not see, but sense movement – I’m guessing because of changing light patterns. If you show up they think you are a predator and will avoid you. Don’t take it personally. Regardless of your intention, it is agitating if you handle them. Please keep in mind also when handling them that their skin is hypersensitive. Your body temperature is typically 40 – 60 degrees warmer than theirs. I’m not sure what that feels like to them, but 40 – 60 degrees warmer to us is scalding. If you want to look and touch, one suggestion is to place a bit of moist material from the bin on your hand first and put the worm on the material. At the risk of seeming overprotective, I prefer to place my worms down rather than dropping them into the bin. While worms are pretty rugged critters, dropping them even from a few inches, is comparatively much like dropping you from a roof top or even higher. In my mind, being kind to them is just another way to be responsible stewards of our livestock. To have a successful bin experience, I recommend being selective about what you feed the worms, especially at first. 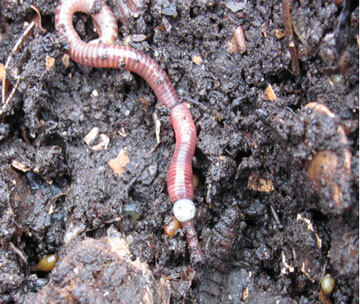 In an open compost pile – with or without worms – one has the luxury of capacity. In a worm bin, space is limited, and discretion is called for in what you serve the worms. Worms will only be able to eat what fits in their mouths, so large solid items such as carrots, or broccoli stalks must first be broken down into smaller bits by the other organisms in the bin or be chopped or ground to expose more surface area for the organisms. The organisms reside on the surfaces of the food particles so the more surface area the more available the food is to decompose. I prioritize feeding raw fruit and veggie scraps. For the most part, worms will avoid things that are too spicy, such as onions, hot peppers or garlic, or too acidic, such as citrus peels or pineapple. Food that will decompose quickly such as melon rinds, leafy greens, and soft fruits and veggies are consumed rapidly with the help of the bin’s resident microorganisms. Old tea bags and coffee grounds are welcome. To prevent clumping, mix the grounds into the surface of the pile. While some tea bags fully decompose, nowa-days many tea bags use plasticizers in the fabric so do not readily break down. It’s helpful if you tear the bags open to allow access to the contents. If you factor that worms consume half their weight per day on average and you know how many pounds of worms you have in your bin, then you can figure out how much food to feed them per day or week. Keep in mind that the food is not eaten in one sitting, but consumed on a continuum as it is decomposed by the other critters at the table, so do not expect the banana peel to disappear in one afternoon. At the risk of seeming anthropocentric, the worms appear to enjoy things they can nestle into such as the core of corncobs once the center has been eaten away. Nested avocado skins also provide a safe haven for a cluster of worms, as do the inside of mango pits if they have not sprouted. Place a corncob or two just beneath the surface. The cob will eventually be hollowed and filled with castings. I’ve noticed that the worms tend to deposit cocoons in these protected spots. I’ve heard that corncobs are difficult to compost. The worms disagree. Cobs in a worm bin will decompose and also provide a safe spot for the worms in the meantime. The cobs also attract numerous other bin inhabitants as well, so if you are in the mood to do some science, have a look for some of the other visible decomposer species in the bin – both red and white mites, springtails, and pot worms are common. And if you have a healthy fungi population, you may even see a mushroom pop up. One unique method of providing food for your worms is to locate the bin beneath a rabbit cage. Rabbit droppings are an ideal source of food for the worms and come fresh from the source. The pellets fall through the screen mesh floor and continuously feed the bins. It’s useful to add carbon bedding material from time to time to balance off the nitrogen rich droppings, and to keep the material from becoming too densely packed. Baked goods tend to generate mold, which can be problematic, so I discourage them. Sliced bread does serve a purpose in the bin however. If you happen to get an overabundance of mites, you can lay a piece of bread on the surface of the bin for several hours. This serves as bait for the mites that accumulate on the bread. You can remove the bread, and set a new piece. The mites will be gratefully received by most insect-eating aquarium fish, or you could release them into the wild where they can help decompose other things. Excess mites indicate too much moisture in the bin. Leave the lid off for a few days and things will dry up. Before and After – Separation by light avoidance. The worms burrow towards the center of the pile when exposed to light. Scrape the castings away until you see worms, then leave the worms to burrow deeper. By alternating these two steps, you can separate the worms quite effectively. It’s important to know who else is in the bin with your worms, but first, I must reveal a secret. It’s also important to know that the worms are not really eating your apple cores. All the other macro and microorganisms are. The worms are eating the microorganisms, of which there are billions in a thriving worm bin. Worms feed by opening their most-mouth-like part (prostomium) which is a cross between a muscular upper lip and a shovel, and ingest what happens to be in their path. Bits of apple core get in, but only after they’ve been broken down by the bacteria, fungi, protozoa, and nematodes, which also get in. Mites, spring-tails, and pot worms are visible to the eye, and too large to be ingested by the worms. You may also have millipedes, or centipedes. It’s useful to know the difference between the two. Millipedes are slow moving and contribute to decomposition. Centipedes dart about quickly and will eat worms. If you see a centipede, it’s a good idea to capture it and release it into the outdoors. They can bite, so be careful. If your bin manages to become anaerobic you may discover black soldier fly larva (BSFL), or much less frequently, black soldier flies themselves hovering around. BSFLs are big cuddly grubs. At first sighting, they can be a bit startling, but as voraciously productive decomposers they are your friends. BSFL will ingest proteins and fats as well a vegetable scraps. There are some who are managing their bins for BSFL and have forsaken worms. BSFL are high in protein and your backyard chickens will adore them. When the bin is full it is time to harvest the castings. It is helpful to let the bin rest for a week or two, or longer if needed, without feeding to allow as many remaining food particles as possible to be consumed. If you have one, a second bin allows you to continue composting while the full bin is resting, and also provides a place to reinstate the worms that have been separated. A second bin also can become a supply of already mature and familiar bedding. There are several methods of separating the worms. The one that I find most productive for the small scale is the light-avoidance method. Worms will avoid light whenever possible. If you loosely pile up the bin contents into one or more shallow cones or rows, any exposed worms will immediately begin to go back down into the pile. If you then let the pile settle for a half hour or so, the worms will have moved sufficiently away from the surface allowing you to scrape away the top layer of castings until you begin to see worms again. By alternating settling and scraping, and keeping an eagle eye out for the cocoons, you will eventually have removed all the castings and be left with a teeming mass of worms and pile of cocoons to restart your next bin. Rubber gloves are optional but recommended at your discretion. I use them only if a bin has anaerobic pockets. • A flat smooth surface. I use a 3’x3’ piece of untreated ½ inch plywood for small batches, or an old hollow core door on a couple of sawhorses for larger batch-es. • Four appropriately-sized containers. One for the worms and cocoons, one for the castings, one for periodically rinsing your hands, and one for non-compostable objects such as pebbles, pits, etc. Soaking these castings-covered cast offs in a container of water will provide a potent nectar that is great for watering your plants. • A sheet of plastic will protect your kitchen table, but I find it a little more tedious to round up the individual worms that cling to the plastic. It’s helpful to have a dedicated lifting tool with no sharp edges to slip under the individuals. A tooth pick like object seems to work just fine. You do not need to remove every last bit of castings. In fact, it’s helpful to mix some of your old castings into the fresh bedding in the new bin. The worms are used to the old habitat and the adjustment to a new bin will not be so abrupt. The topmost strata in the bin contains the majority of the worms and remaining food particles. It will be a head start if you can remove this layer to help start your next bin. Depending on your use for them, it is not necessary to screen the castings. When needed, however, I screen castings through 2ft x 2ft screens. The first pass is through quarter-inch hardware cloth, and a second pass through eighth-inch hardware cloth. Both screens are framed on edge with 1×3. The quarter inch screen helps break up the clumps and remove cast-offs. It also gives you another chance to find a few remaining worms and scan for cocoons. If you screen with the screen side up, and slide the frame along the table surface rather than lift and shake, the siftings will be contained neatly within the screen frame. The 1/8-inch screen further breaks down the clumps, helps isolate cocoons and any remaining worms and cast-offs. The end result of screening is a consistently sized debris-free castings pellet that is easy to handle, measure, and store. Migration is another method of separating that typically is more successful in larger commercial bins or row composting set-ups. But, for smaller bins, divide the bin in half, remove one half of the bin contents and set it aside in a separate bin. Move the remaining amount to one side of the bin. Fill the now empty side with fresh bedding and appealing food. Do the same thing with the amount you removed. The time varies, but eventually the worms in the older half will migrate to the newer half. This method requires less of your time than light avoidance, but is not as thorough because it is difficult to account for dawdlers, cocoons, and all the babies, which continue to hatch on the old side of the pile, and which you are obliged to patiently wait for, while they find their way. I have never had great success with this process and would be happy to hear if someone has. If you have space for a bin that is sufficiently long enough to compost along it’s length, begin by adding bedding and food at one end, and adding new food in sequence along the bin length. As the original castings mature, the worms and everybody else will migrate successively along the row to the freshest and most appealing part of the buffet. The theory being that by the time you’re feeding at the far end, the first end will be sufficiently processed enough so that young and old alike will have departed to greener pastures, leaving the original end of the bin ready for harvesting. There are many variables about volume and size of bins, but depending on your eating habits, a bin 18 inches deep by 24 inches wide by 6 to 8 feet long should be roughly adequate for a 4 – 6 person household. Feeding is done in thin diagonally sloped wedges along the length of the bin, burying and covering the contributions as needed. Regardless of how you separate them, store the castings in breathable fabric bags or a plastic container with a loose lid. Keep in mind that paper or cardboard containers may be eaten over time by the inhabitants. The organisms will remain vital while there is still moisture and oxygen present, but go dormant as the castings dry out. The sooner you use your castings, the more vital they will be, as some organisms will perish over time. The nutrients will remain stable for longer periods depending on storage conditions. Cocoon being deposited. Note how the “head” of the worm has narrowed and the muscles behind the cocoon are pushing it forward and off the worm. Worm cocoons are the underpinnings of a successful bin. As your bin matures and the worms have comfortably established themselves, they will begin to de-posit cocoons. The more cocoons you see, the more you know your worms feel secure in the habitat you’ve created for them. Once deposited, the cocoons gen-erally take 2 – 6 weeks to incubate and hatch, depending on conditions in the bin. Cocoons can lie dormant for up to two years if suitable conditions for surviv-al are not present. While you are encouraged not to let your indoor worm bin freeze, in outdoor compost or in the natural world the cocoons will successfully overwinter and quickly replenish their habitat in the spring, replacing any worms that may have perished from the cold. You can use the castings for top dressing or for mixing with water for your house or garden plants. Proportions vary according to species, but generally a 15 – 20 percent ratio of castings to soil mix is adequate. Up to 50 percent with water. Castings also impart an increased level of immunity to your plants. To boost immunity, soak your seeds in castings tea, castings steeped in water, or start your seeds in a moist castings/soil mix. Your plants will be happy to receive peri-odic waterings with castings nectar or be the recipient of a top dressing from time to time. Think multi-vitamin with probiotics. If you enjoy worm composting on a small scale and want to expand, there is always a need for worms and castings. Be wary of get-rich-quick offerings, howev-er. Many elementary schools have worm bins in their classrooms or school garden, and would be happy to receive your extra worms. An established worm bin makes an excellent gift for any urban farmer. Also, the Worm Ladies of Charlestown, Rhode Island, are always willing to purchase your extra worms and castings. In fact, the Worm Ladies are in the process of forming a cooperative of small-scale worm growers to help meet the growing demand for worms and castings in the northeast. If you want to find out more about the Rhody Worm Coop, here’s the link. http://wormladies.com. Newly deposited cocoons are greenish-yellow and look like tiny lemons about the size of BBs. As they mature they become more and more reddish. 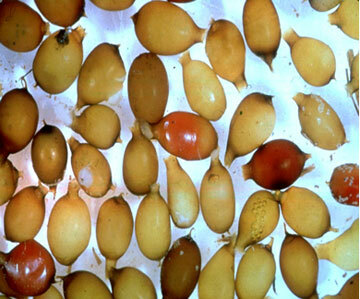 Worm-colored cocoons are about to hatch. Consider yourself fortunate if you happen to observe a cocoon being deposited or hatching. Every worm keeper has a trusted method, yet there is no one perfect way to compost with worms. There is no end to tales of success or woe from vermicom-posters far and wide, although I have repeatedly observed that if you do your best to mimic the conditions that worms would choose in the natural world, you will have success. Keeping in mind that worms and microorganisms have been decomposing organic matter for much longer than humans have been keeping them in bins, observation and experience are the best teachers. Pay attention to what the worms and the bin ecosystem are telling you. The microbial popula-tion in the bin is a hugely diverse and fascinating web of life with much yet to be learned about how it might benefit the soil, plants, and humanity. I continue to learn from new and experienced worm keepers alike, and I continue to be captivated by the process. It’s also a tremendously good feeling to know we are contributing to the health of our life-sustaining soil. • Composting with worms converts a waste product into a usable resource and is good for soil, plants, and the environment. 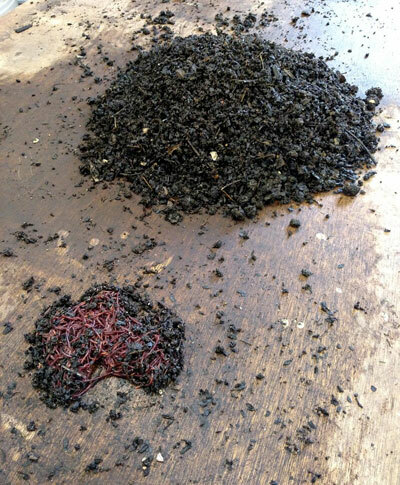 • Red Wiggler worms are efficient decomposers and thrive in worm bins. They are able to double their population in 2 – 3 months. • Select a bin that’s the right size and format for your needs and location. Red worms will eat more or less half their weight per day. • Decide on what type of bedding you will use for worm habitat and have a supply available. • Be sure the bin is protected from freezing and overheating. • The bin should be moist but not soggy. • Feed raw vegan scraps, the smaller the better. Tea leaves, coffee grounds. Do not clump or over-feed. • Avoid feeding hot spicy foods such as onions or garlic. Avoid citrus, meat, dairy products, oil, fat and bread. • The easiest separation method for small scale castings production is the light avoidance method. Pile castings on a flat surface. Worms will hide inside the pile from light. Remove worm-free top layers of castings once worms have burrowed inside. • Other separation methods include half-bin, long-bin, or wind-row migration. • Store separated castings in plastic breathable containers. Keep the lid loose. • Castings and castings tea improve soil vitality and boost plant immunity. • Mix castings 15-20% with water or a soil mix for best results when using them as fertilizer. Periodically water or top-dress your plants. • Pay attention to your worm bin habitat and the habitat of worms in their natural world: biomimicry.